So, started Thrawn yet? I am only at 22% = page 103. I do wonder if he is not going to do something really mean at the end. He's too "nice" right now. I am refraining from reading the last pages of the book, which is a bad habit of mine. Lol... I do the same thing....read the last couple of pages and then start from the beginning.... to be frank. I haven't had a chance to start reading the book as yet (which is really unusual for me) due to some RL stuff going on but hopefully I'll start from Tuesday. I'm dying to read the book, especially after hearing all the good reviews on youtube. No worries, you have plenty of time to catch up. I am only halfway through the book. I am a slow reader when it comes to SF / fantasy books - trying to absorb the descriptions - and I don't have much time to read right now so it's 1 hour here and there. It is a good book so far. Thrawn is Thrawn. You never know what his end game is, but the fact that you get a glimpse of how he thinks is a nice trick and adds a lot to the book. It was a bit weird at first, but then you get used to it and enjoy it. I was a bit surprised by Governor Pryce's backstory, but it works. And there's another character that is also interesting - poor thing, his life never takes the turn he wants it to take. I should probably post in another thread, but since Thrawn is part of SW Rebels and I think we might be the only 2 who will read it, might as well use that one. The book made me wonder though what is the end game for Thrawn in SW Rebels. I gave in and read the last 3 pages of the book and there is a reason for what he does, but is that the same one? Probably. I suppose only Thrawn fans will want to know the reason so no need to mention it in SW Rebels. Finished the book! Started reading yesterday morning and finished it last night....the only other SW book which I read like this was Dark Disciple...Thrawn is now sharing the #1 spot with DD among the SW books I've read so far! Now have started on the Guardian of the Whills book....its interesting but not as riveting as Thrawn. Told you, you would be faster I haven't read a single page in 3 days and I doubt I will read anything this WE. It'll probably take me a couple of weeks if I find some time evenings. So I finally finished Thrawn 3 days ago. Yep, it took some time reading it by chunks of 30 minutes here and then. I liked it, but my favorite canon SW book still remains Bloodline. I have not read Dark Disciple. I find the book quite fascinating in its depiction of characters that supposedly are on the bad side. Eli Vanto is definitively one of these characters along with Ransolm Casterfo and Rae Sloane that are only in books (so far) and that I hope will make it in one way or the other in movies, because I really like them. Thrawn is... Thrawn. It's difficult for me to align with his motives because I am a sort of a free electron, as we say in French, who does not really feel like she belongs to any people. I'd actually rather go to extremes to save non-human animals, that have no voice of their own - at least one that is being listened to -, that any humanoid specy including mine. But I do appreciate that he is trying to limit the number of casualties at all times and that he is fair to people that are fair with him. So I do have some respect for the character. At the same time, I have the feeling that in the last episodes of SWR, he was shown in a less composed manner, being a bit agressive towards the Rebels - maybe I remember it wrong. I would prefer a relationship Thrawn/Hera that mirrors the one with Nightswan except with a different ending. Then you have Governor Pryce. I think there the parallel with Thrawn is really good. They are both doing things that hurt people, but Thrawn tries to live up to a certain code of honor, while she is just pure greed incarnate. I want to see that woman die in Season 4 of SWR. Or worse: being ripped of her title and sent to work in the mines I am only surprised she did not let her parents die or kill them herself. I watched the panel Animated Origins and Unexpected Fates. Surprised it was only uploaded a couple of weeks ago and not earlier. They are really teasing on Ahsoka's return. They also seem to imply that the 2 clones who were with Rex could return because DF likes them. DF also laughed at people's reaction whenever he mentions Hera and Kanan together. Dude, you're guilty of it with the "luv" and that hug at sunset I was also interested by him saying that he pays attention to the stories being understandable for people who have never watched Clone Wars and only watch SWR. I must say they do a great job because I haven't watched CW and never felt frustrated watching SWR. That's why I still believe there will be no major crossovers from animation to movies. It just demands too much explanation and it's so packed already. @SanghaRen wrote: I watched the panel Animated Origins and Unexpected Fates. Surprised it was only uploaded a couple of weeks ago and not earlier. They are really teasing on Ahsoka's return. They also seem to imply that the 2 clones who were with Rex could return because DF likes them. 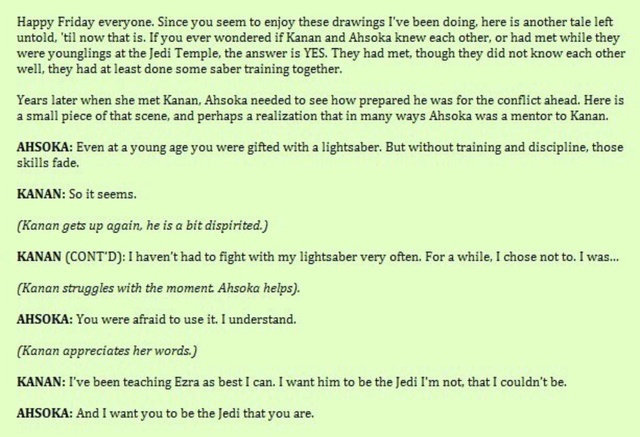 DF also laughed at people's reaction whenever he mentions Hera and Kanan together. Dude, you're guilty of it with the "luv" and that hug at sunset ;) I was also interested by him saying that he pays attention to the stories being understandable for people who have never watched Clone Wars and only watch SWR. I must say they do a great job because I haven't watched CW and never felt frustrated watching SWR. That's why I still believe there will be no major crossovers from animation to movies. It just demands too much explanation and it's so packed already. :D I agree on it being easy to watch rebels without the clone wars. I just finished the clone wars a week or two ago actually so I didn't know a lot of stuff while I was watching rebels and I still loved the show. Though now I'm really excited to see the other clones again haha cause I love Gregor. He was only in one episode of the clone wars, and I was worried he didn't survive, only to look him up and realize he was one of the clones with Rex! :D if we get to see more of Gregor and Wolf I will be very happy. Also, the Vader ahsoka battle was great, but now that I've finished the clone wars story it's even more emotional for me dang it. I need to rewatch everything xD and I'm going crazy with Dave Filoni being all mysterious about whether Ahsoka will show up again. But yeah idk why it took them so long to upload. I guess since this is the one with a PowerPoint that didn't show up in the livestream, fixing it took some work. I love that tweet! It's so cute. I can't wait to see the episode(s) with the wolf. So did anyone ask "ok, she's not the wolf, but is she the owl?" because you know once you start clarifying stuff, it never stops. I'm so excited for this upcoming season too! I love the SW animals and creatures. That's a good question about the owl. I'm sure it will only be a matter of time before someone is brave enough to ask Filoni or Pablo that question. My guess though, if Ahsoka is indeed dead and not a reincarnation of the wolf or owl, maybe she uses the animals as temporary vessels (kind of like Warging on GoT). It would be a cool new "force ghosting" way to communicate or intervene. I watched the confrontation between Ahsoka and Vader again today. Vader is basically toying with Ezra, but then Ahsoka shows up. She's a seasoned force warrior in her physical prime, going against someone in Vader who is physically encumbered by this suit, who has mechanical appendages, and who is a bit past his prime physically. I'm thinking "She is the only one in the galaxy with a chance to defeat Vader". 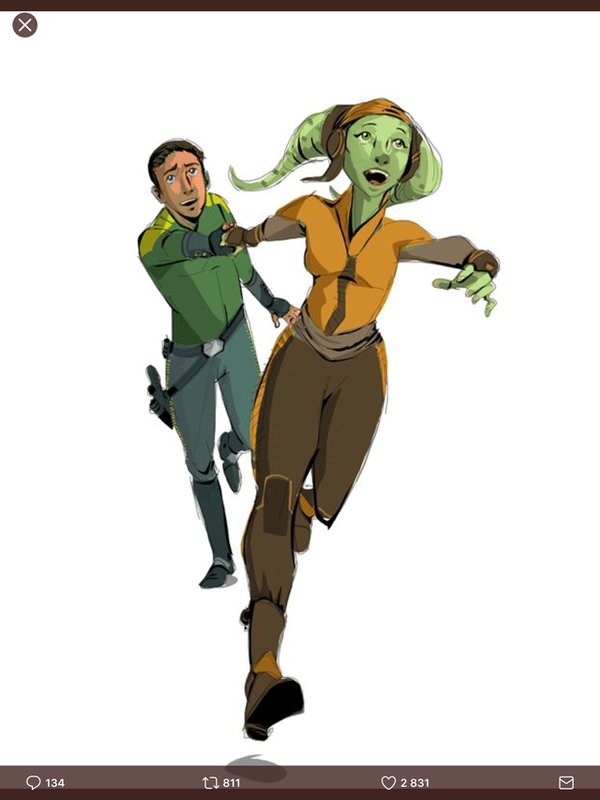 And indeed, after holding her own for a while before being knocked off a ledge, she recovers and runs at him from behind, he is slow to react while he is trying to get the holocron from Ezra, and she slices off a piece of his mask. So at the end of the scene, Vader limps - very slowly, as if one of his legs is not functioning - away from the temple, and we catch a glimpse of Ahsoka descending back into the temple. People are wondering if Ahsoka is still alive, and if she is, they wonder "Why did Vader spare her?" Why did Vader spare HER? Are people watching the same scene I'm watching? People, Ahsoka spared HIM. That's why she doesn't return to the Rebels after that. She's failed the Rebels because she chose loyalty to him - she could have killed him right there but she let him walk away. And now, she is alone. She's forfeited her alliance with the Rebellion, and with whatever surviving Jedi there may be, by allowing him to live, and yet she will never join him or the Empire. And he's not going to come looking for her either. Because he knows he will get his a** kicked. It is the beginning of a long string of failures for Vader that will culminate in his redemption when he finally throws the Emperor down the chute. Vader was the opening through which Luke gained access to the Emperor. But in this moment, Ahsoka must be feeling great shame and responsibility and turmoil for all the destruction Vader will cause from this point forward. 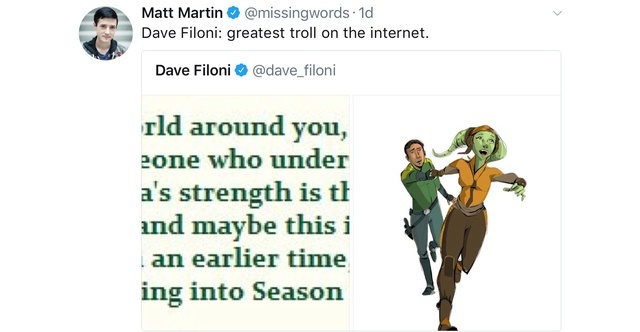 Dave Filoni trolling with Matt Martin calling him up on it. I wonder if he drew that. Could be. And one after that which I included in another thread but seems suited to this one too. 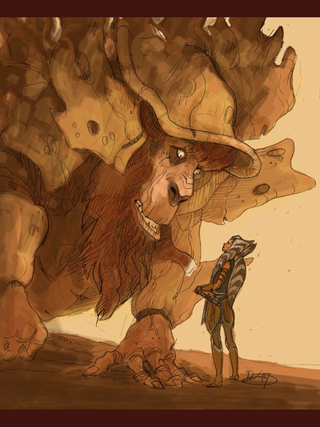 I want to hug those Lothal cats. 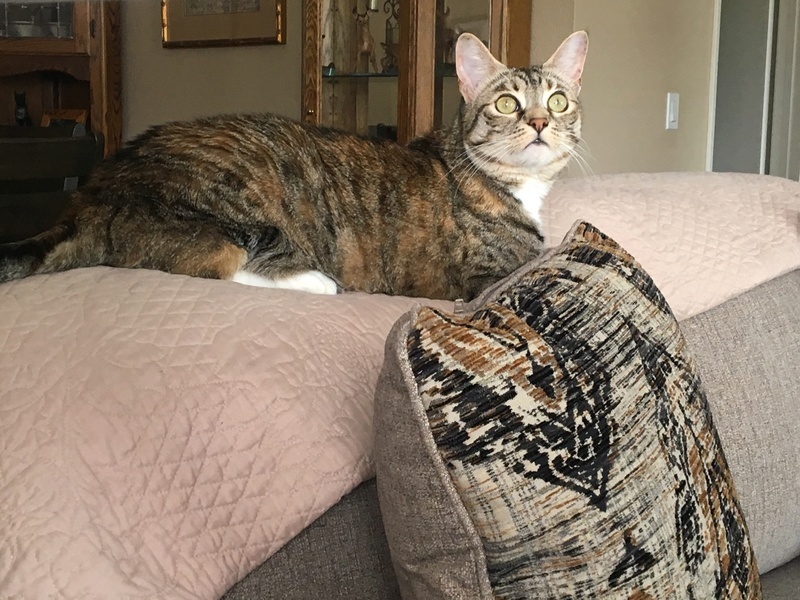 My cat would fit in, she's got big ears too. 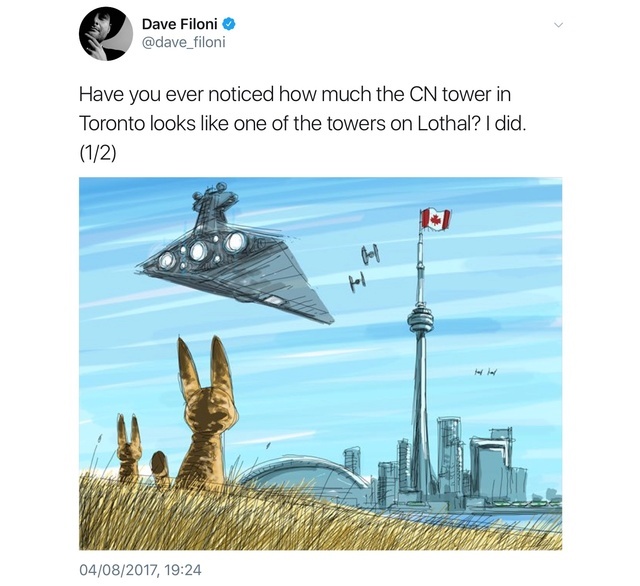 I hope DF continues to feed his account with drawings. @SanghaRen wrote: Lucky people of Toronto! I agree! They are so cute! Here's my Loth-cat, Panda. 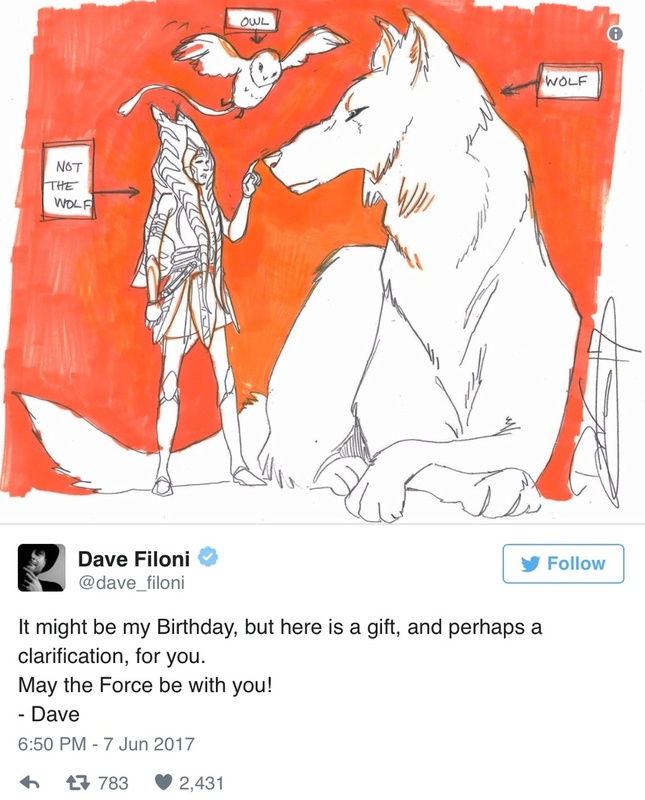 It makes my day whenever Dave Filoni posts a sketch. Aw Panda is so cute! 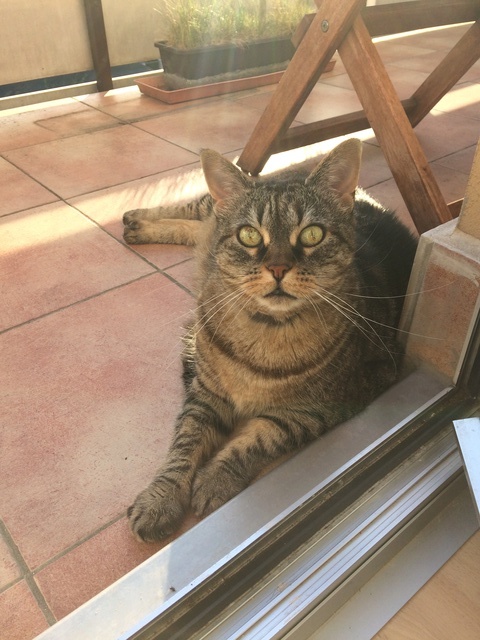 Your cat is gorgeous and I love the name. No, I did not see it. No, I didn't see it. Damn, I saw it. 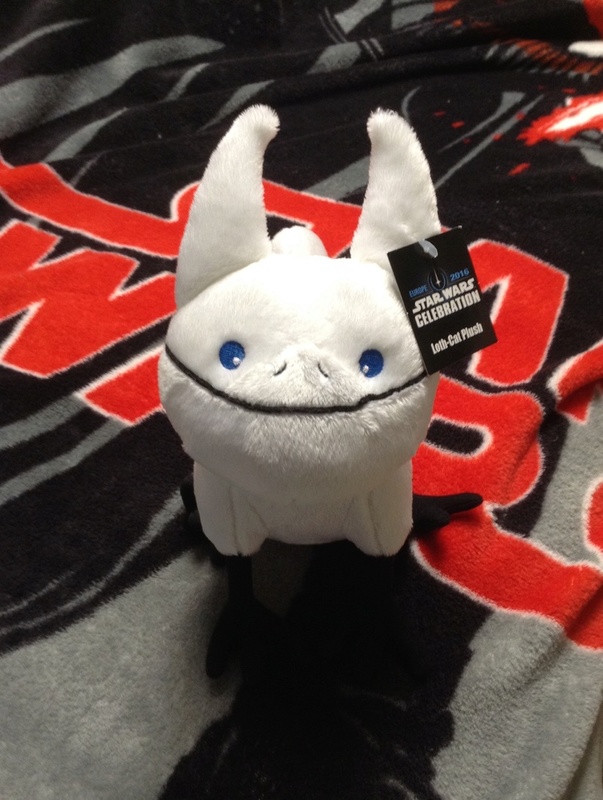 I want that Loth-cat plush so bad now. 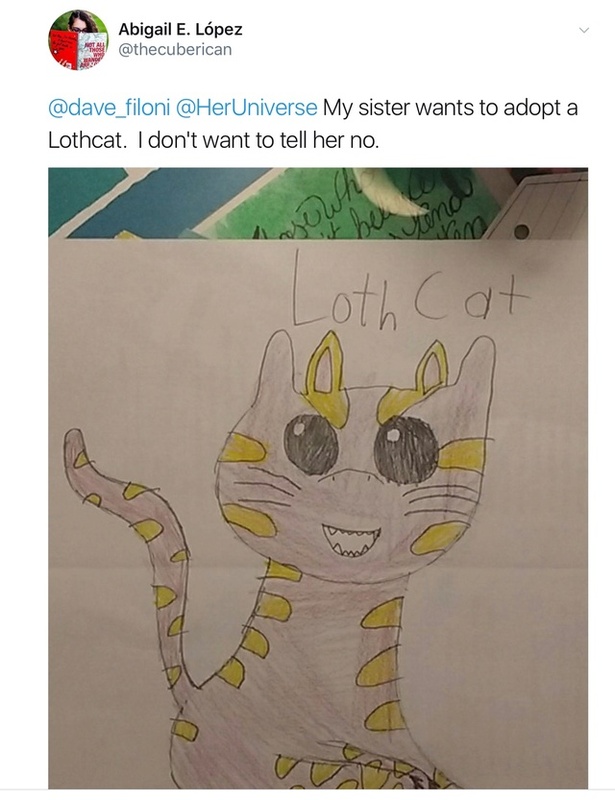 This is my loth-cat. Her name is Sangha. 13 years old and all her teeth, for now. Thank you! Your kitty is super cute. She looks like such a sweet old lady. I'm so jealous! That plush is too adorable. 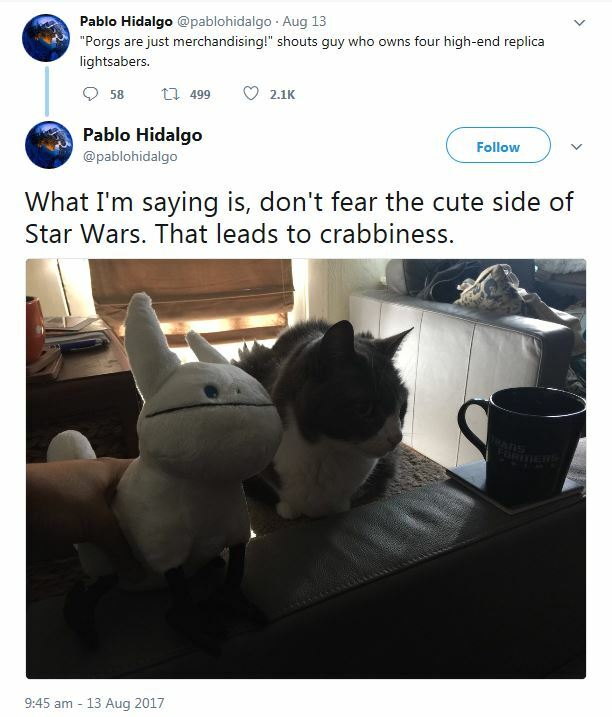 Speaking of loth-cats, Pablo's cat loves them too. @SanghaRen wrote: Speaking of loth-cats, Pablo's cat loves them too. Okay, so I've been thinking a lot about how Ezra will succumb to the dark side in season 4. My theory stems from what the Inquisitor/Temple Guard spirit said to Kanan in the episode "Shroud of Darkness". He said something along the lines of "if you attempt to save him, you will perish for your failure" (not an exact quote). The Inquisitor has also told Kanan that "there are some things more terrifying than death". Forgive me if this has already been speculated, but what if Ezra kills Kanan? Now, I can't see Ezra deliberately striking Kanan down, but I can see a scenario play out where Ezra is about to strike out, in a blind rage, and Kanan attempts to stop him only to be cut down. What's more terrifying than death? How about accidentally killing your mentor, friend and father figure? That would be the final nail in the coffin for Ezra. His final step into shadow so to speak. This theory was sparked after I watched a clip from the "KoToR: Knights of the Fallen Empire" video game where Thexan attempts to stop his brother, Arcann, from killing his father only to be accidentally killed himself. I don know, its crazy. LOL! But Filoni does like to say " there is always a bit of truth in legends". @TheBastardofMandalore wrote: Okay, so I've been thinking a lot about how Ezra will succumb to the dark side in season 4. My theory stems from what the Inquisitor/Temple Guard spirit said to Kanan in the episode "Shroud of Darkness". He said something along the lines of "if you attempt to save him, you will perish for your failure" (not an exact quote). The Inquisitor has also told Kanan that "there are some things more terrifying than death". Forgive me if this has already been speculated, but what if Ezra kills Kanan? Now, I can't see Ezra deliberately striking Kanan down, but I can see a scenario play out where Ezra is about to strike out, in a blind rage, and Kanan attempts to stop him only to be cut down. What's more terrifying than death? How about accidentally killing your mentor, friend and father figure? That would be the final nail in the coffin for Ezra. His final step into shadow so to speak. This theory was sparked after I watched a clip from the "KoToR: Knights of the Fallen Empire" video game where Thexan attempts to stop his brother, Arcann, from killing his father only to be accidentally killed himself. I don know, its crazy. LOL! 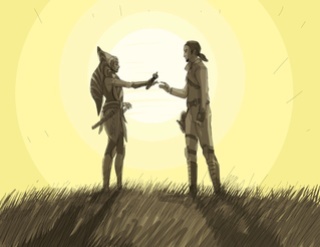 But Filoni does like to say " there is always a bit of truth in legends". Why do you think Ezra will succumb to the dark side? He already faced the test and passed when Maul was trying to tempt him. In the last episodes he has shown nothing but a kind heart and a lot of maturity. I might be wrong but I don't see any hint that he'll fall to the dark side not in the last episodes of season 3 not in the trailer for season 4. I always wonder why so many people seem to expect this ending for him and I don't understand what that would bring to the show. He is not Anakin, why should he follow the same trajectory? That someone or several characters might die, yeah, I could see that , but dark side? There has to be some sort of closure for the show. The show ending with a character used as an example for kids (I believe it's still PG7 and 6 in some other countries) turning evil or even killing his mentor by mistake is like grim, very grim. I don't know but I don't see them going down this road especially not when they had the opportunity to make him fall earlier in the show and then had a chance to show his redemption.